Thread: Does anyone know what this is? Everytime they show one of these pictures there is no description. I am fascinated by this picture. I want to know what I'm looking at and the story/culture behind it. I've tried a few searches, but with nothing to go on I'm not coming up with a result. Anyone have any ideas as to what culture or people this is? Or if it's just a weird photographers photo shoot? Tried TinEye, the reverse image search, but it came up empty. However, after doing a few google searches on african headdresses, I found similar headdresses as the ornate wooden antelopes you see on these two. This gave me a name "Bambara" and soon enough I found this exact picture. 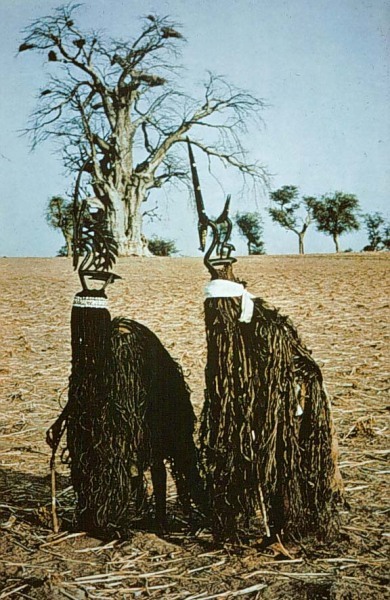 Turns out that what you see here is the traditional dancing attire of the Bambara tribe of Mali. Tineye! Damn it, that's the name of that image search. I was racking my brain on that too. I figured it might yield results. Awesome man! The Detroit Institute of the Arts has a number of these masks on display (there is one in particular that I find fasinating, like a giant crocidile head with a hinged jaw) I'll post a pic if I can find one. Man! I wanna see someone headbang with one of those! Whoa, whats the site that you found those on? Wow, that stuff is F'in weird. Very cool find though, thanks for sharin. 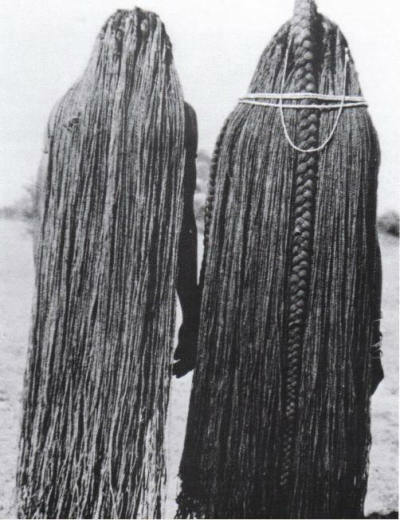 yeah those are totally west African head dresses, probably with raffia tassels covering the wearers. Actually I just found this website that has a ton of pictures of the people wearing these and dancing with them. African art is so absent from art history it really is a terrible shame. There's some really incredible art that's been made over the thousands of years of human endeavor on that continent, and so much of it just pillaged and stolen by the colonial powers. One of my favorite, and I think one of the most intense pieces of African (Congolese I believe) Art is the Nkisi Nkondi. They are figures created to contain spiritual powers and spirits themselves. Usually they were small human figures with tons of nails driven into their bodies and faces. From what I've read this is done during the creation ritual inorder to "awaken" the spirit channeled into the figure. I've personally been around a couple of these and they can be really creepy, and have a kind of intense presence to them. Nkondi figures were minkisi of the above that ranged in size from small to life-size, and contained medicines, usually hidden by resin fixed mirrors. These figures were usually in the form of wooden figures with open cavities in their bodies for medicines. The most common place for storage was the belly. The KiKongo word for belly is "mooyo," which also means "life," and is most likely the reasoning behind the placement of the medicines. Other common places for medicines included the head and in pouches surrounding the neck. A nkisi figure without medicine is useless and serves no purpose. It is simply a container that gains its power from the medicine. In most nkondi figures the eyes and medicine pack covers were reflective glass or mirrors, used for divination. The nganga could use the mirrors to look into the world of the ancestors. Some nkondi figures were adorned with feathers. This goes along with the concept of the figures as being "of the above," and associates them with birds of prey. Minkondi often have their right arm extended with a sharp blade grasped tightly. Nails and other bits of metals are often driven into the nkondi figures. Many of the explorers of the late 19th and early 20th centuries referred to minkondi as "nail-fetishes." Their lack of understanding caused them to completely ignore the real intentions and uses of the minkondi. The patrons of the nganga drove these nails into the figure to "awaken" the nkondi. The creation and use of nkondi figures was also a very important aspect to their success. Banganga often composed the nkondi figures at the edge of the village. The village was thought of as being similar to the human body. The idea that the edge and entrances needed to be protected from evil spirits occurred in both the human body and the village. When composing the minkisi the nganga is often isolated in a hidden camp, away from the rest of the village. After the nkisi was built and the nganga had learned its proper use and the corresponding songs, he returned to the village covered in paint and behaving in a strange manner. Last edited by Cthogua; June 10th, 2009 at 05:12 PM. both seem to be similar collections. The first one lead me to the other one. I would call them NSFW but it's not terribly over the top. Definitely some unique stuff. Most image sites I come across have more or less the same stuff. A lot of what I've seen on these I havent seen before. I wish I could tell you how I stumbled upon it in the first place....the internet is like a choose your own adventure book to me.....sometimes I loose track of how I got where I am. Last edited by Hookswords; June 10th, 2009 at 06:42 PM. so that's where ghostbrush's hair went to. There is a lot of crazy stuff going on, or that has gone on in the past, around the world that most are oblivious to. Africa seems to hide a lot of secrets, and is where humans began being human. An example... As we artists know, the golden ratio is a proportion tat we find, for some strange reason, to be appealing. Natural objects, and humans themselves for some reason fit this pattern (such as the belly-button being in the golden ratio to a persons height). We as humans somehow organize things into this ratio without knowledge of it, because something tells us it looks "right", Perhaps it is biological, from recognition the proprtions of humans as being attractive. That may be the reason we organise composition, architecture, everything into this ratio. For some reason, in Africa, these cultures that have no knowledge of western math or ideas of visually pleasing geometry as the western world has "discovered", have built their villages and created their imagery as fractals. How and why? The concept of fractals has only been known in the west for a few decades, and here is an etheopian culture using sophistacted algorithms of repeating patterns, without knowing it, it's just how they think naturally. Can this fractal nature of most african tribal cultures be something we westeners sub-conciously pick up on and find unsettling. Fascinating stuff. Goddamn that was an interesting TED talk. It really makes me wonder about knowledge vs technology. For a loooong time Europe, and the euro-centric sciences have assumed their cultural, and intellectual superiority because of their technological superiority. There's this left over, 19th century assumption that technology was an adequate measure of a culture/civilizations "advancement" upon an assumed linear, hierarchical ladder tied to metal based technological development. It seems like knowledge can act as a kind of mental technology as well, allowing the knower to observe structures and patterns invisible to the untrained eye. Obviously this kind of technology would be of more use to societies with extremely limited resources, or beliefs that limit their use of available resources, than tech requiring the mining of minerals, and complex forging methods. I've been thinking a lot lately about this idea of knowledge based mental technology, and how trained we are to assume a material technological solution is automatically the better. We've been trained to doubt our own senses in favor of the output of a trusted machine. I'm not advocating technophobia, however I think we live in a "naturalphobic" society that only trusts it's own constructs, however maladaptive they ultimately turn out to be, over those available and present in the natural world, and actively distrusts "natural" solutions. We see the medicines an amazonian healer gives out, and assume the only actual way they work is placebo and religious belief, and disregard the fact that he can identify over 80,000 species and sub-species of plants, many of which seem completely identical even to a trained botanist, and has perhaps thousands of years of collective knowledge of plants, their effects, perception, and how to manipulate it, what the effects of those manipulations have, and so on, passed down through the various traditions and cultures which have lived in that particular place. I think something else that talk reveals is that at one point nearly everything we now call science, especially mathematics was at one point a system equated to magic. Not because it produced unexplainable results, but because magic was mans attempt to control the forces that shape and drive the world. This is exactly what modern sciences and technology have become, just without the assumed responsibility of the wielder. Perhaps one could say that any sufficiently non-advanced technology is indistinguishable from religion, depending on how you look at it. It took a mathematician to recognise the patterns in the african villages. Everyone else who asked these people how come they made hese things like that, would see nothing but religious beliefs and not see/ignore the complex mathematical resning behind their religious practises. Everything we know is based on observation and interpretation, that is how our culture and science has evolved. While western science is perhaps more robust and cohesive than the natural-sciences of other cultures, which still mix religion and faith into reason. There are obviously many answers lying out there, in plain sight, waiting to be seen for what they are.